Officers of the Federal Security Service (FSB) and the Ural customs service have found a 1945-made T-34-85 tank during the inspection of a train in the city of Kartaly, in Russia's Ural Chelyabinsk Region, heading across the Russian-Kazakh border. 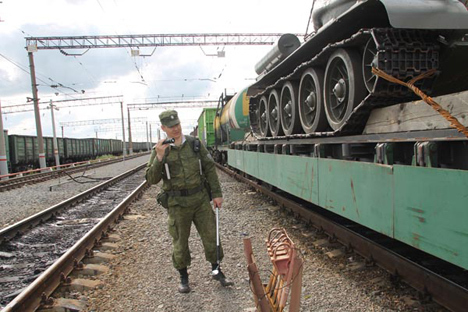 A criminal case was opened on attempted smuggling of cultural values, as a tank shipped in transit across Russia was found on the train, the press service of the regional FSB department said on Aug.5. Experts found that the tank's armor was out of combat order. The tank's cost was estimated at two million rubles. "The Soviet medium-sized tank T-34-85 was taken into service by the Red Army on January 23, 1944 and was the final T-34 modification. After the end of the war it formed the backbone of tank forces of the Soviet Army up to the mid-1950s," the press release said.